Old school Big Ten football was back with a vengeance Saturday night, as Michigan and Wisconsin slugged it out on a crisp, fall evening in Ann Arbor. With a performance that woke the ghosts of Rick Leach and Denard Robinson, Michigan quarterback Shea Patterson tore up the Wisconsin defense with his legs, rushing for 90 yards, on the way to a 38-13 victory. On the defensive side, Michigan contained the vaunted Wisconsin running attack, keeping the Badgers to 183 yards on the ground. Junior quarterback Alex Hornibrook was unable to execute against Don Brown’s defense, finishing the game with a stat line of 7-of-20 for 100 yards and two interceptions. It wasn’t supposed to be this way. Wisconsin was supposed to control the line of scrimmage. But on an epically awful night for Hornibrook, Michigan was able to stack the box in defense of the Wisconsin ground attack. Meanwhile, after a shaky start running the ball in the first half, the Michigan offense dominated the second half on the ground, with Karon Higdon and the Michigan offensive line asserting control. The game was tight after a scoreless first quarter, but the tide of the game changed when Shea Patterson ripped off an 81-yard run, sparking the Michigan offense, and leading to an easy TD run for Higdon. Patterson later ran in a seven-yard touchdown, and backup QB Dylan McCaffrey romped in with a 44-yard TD run. Somewhere, Shoelace tipped his cap. It was a promising beginning to the Harbaugh Redemption Trilogy. Games against Wisconsin, Michigan State and Penn State will define the 2018 season for the Michigan, especially with the opening loss to Notre Dame and a very difficult closer against Ohio State ahead. Two wins are needed, but really the Michigan fan base will not be satisfied with anything less than a sweep. If they play the way they did tonight in the next two games, a sweep is certainly possible. It’s one thing for Alex Hornibrook to look bad. Normally he is at best a game manager. When he is off, he usually isn’t this terrible. But Saturday night, Don Brown’s defense reduced Hornibrook to a night that will live in infamy. Jim Sorgi and Scott Tolzien never had it this bad. At the press conference, Michigan head coach Jim Harbaugh seemed businesslike. He wasn’t too interested in reveling in this victory knowing that there was more to accomplish. Karon Higdon said people will have to wait and see as far as what this team is capable of. There seemed to be an awareness that this was one step of what needs to be several before they can exorcise past demons, and current criticism. 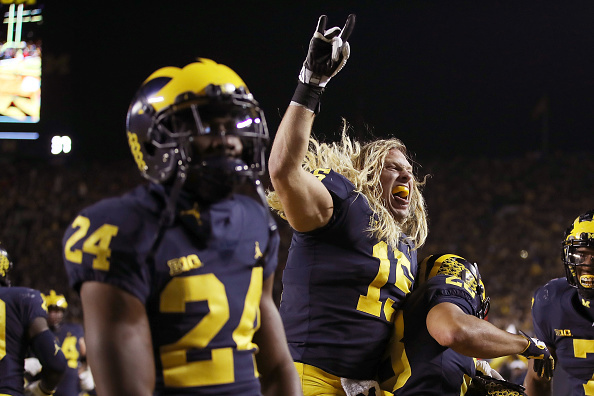 On a night the Wolverines had something to prove, they laid a Big Ten beatdown on the Badgers. Next week, they will battle a newly confident band of Spartans. Both Michigan and Michigan State are peaking, and they have a high stakes battle ahead, an early elimination game in the Big Ten East division. For Michigan, test one is complete.